Here is a shot of my backyard as of last night. You can see the lightening going off in the trees, the guillotine, the hanging man and the cool gate. 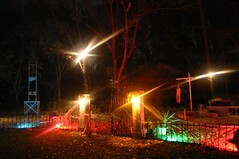 We also have a burning shed, creepy butler, tons of tombstones, an electric chair and a bon fire. The kid party is tonight and my friend Greg is running through the woods with a fake chain saw. Should be fun! The house is clean and we only have a couple more things to get at the grocery store. I'll take tons of pics...I promise.